Calling himself Elston Gunnn, Bob Dylan unsuccessfully auditioned as a piano player with Bobby Vee's group The Shadows. 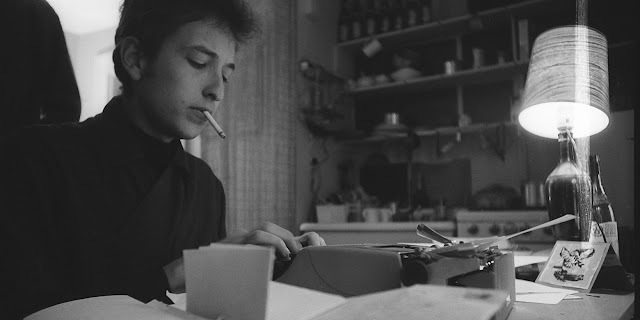 Dylan is seen here typing on an Olivetti Lettera 32 portable. Hank B.Marvin's 1959 Fender Stratocaster. 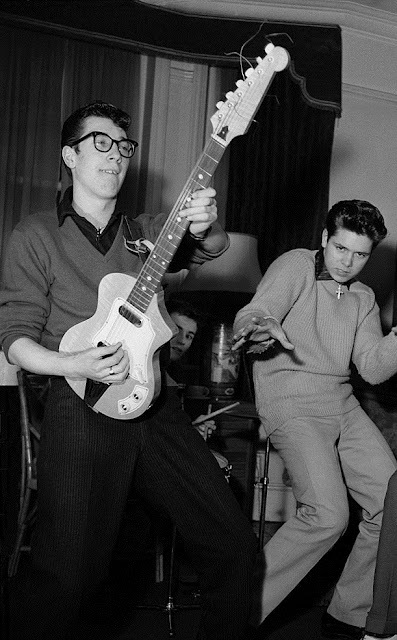 A then 19-year-old Tony Meehan, left, was the original drummer (behind Hank B.Marvin) with Cliff Richard's band The Drifters, who later changed their name to The Shadows, causing Bobby Vee to change the name of his band to The Vees. 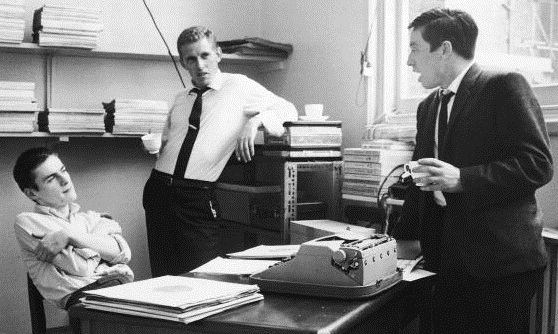 Meehan, seen here with Jay and Tommy Scott and a Facit typewriter, as executive producer and chief A&R man for the Shadrich recording company, had, six months earlier, virtually dismissed The Beatles as a recording group. On January 1, 1962, The Beatles were auditioned at Decca by Meehan. Beatles manager Brian Epstein had paid Meehan to produce the recordings. Decca rejected The Beatles, instead choosing The Tremeloes, who auditioned the same day. A month later, Meehan expressed condescending comments about The Beatles’ audition and The Beatles moved on to George Martin at the Pharlphone (EMI) label. Bobby Vee sadly fell victim to Alzheimer's disease in Rogers, Minnesota, on October 24 last year, aged 73. The last time I was talking to Bobby was in June 2006, when he told me the great story about the time he stood in for Buddy Holly. It happened the night of "The Day the Music Died". Holly, The Big Bopper and Richie Valens had died in a plane crash outside Clear Lake, Iowa, at about 1.07am on February 3, 1959, and a little more than 17 hours later Bobby and his school band were sharing the stage with the like of Dion DiMucci and Waylon Jennings in the Winter Dance Party show at Moorhead, Minnesota, determined not to perform That'll Be The Day (That I Die), Blue Days, Black Nights or even, for that matter, Rock Around With Ollie Vee. Bobby and his older brothers and their schoolmates had been eagerly looking forward to seeing Holly live in Moorhead for weeks before the show. Once Bobby, who earned pocket money as a newspaper boy, had got over delivering the bad news on the doorsteps of Fargo, North Dakota - that Holly was dead - he and his band answered a call to take the place of Holly and The Crickets at the rock and pop show across the Red River. 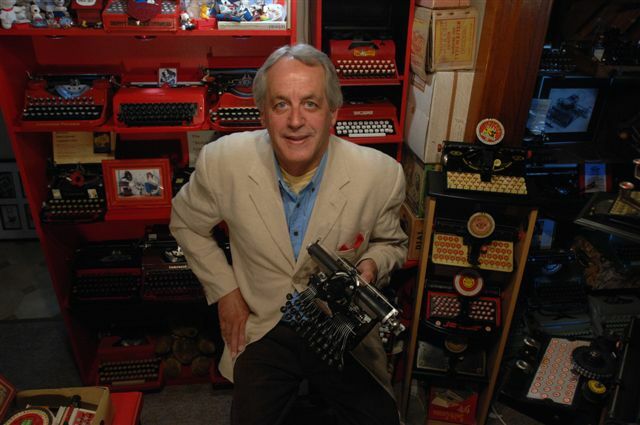 The Vee band had long since, thankfully, got rid of its wayward one-key piano player, Elston Gunnn (note, three “n’s”), a then busboy at the Red Apple Café in Fargo who was also known as Robert Allen Zimmerman, later Bob Dylan. 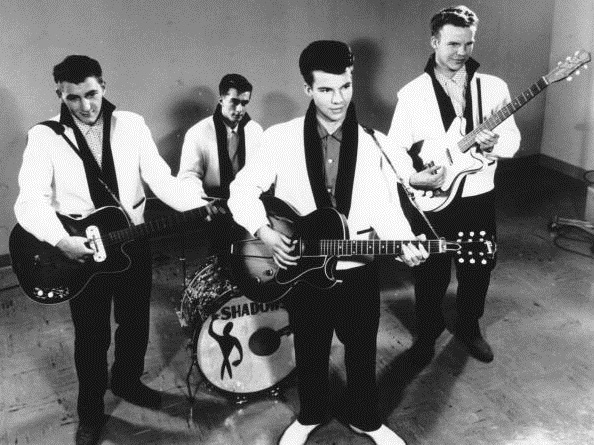 Bobby Vee with The Shadows, who changed their name to The Vees after seeing the English Shadows perform. Already knowing most of these details, what took me by surprise in my chat with Bobby was when he told me the name of the Fargo high school band was The Shadows. 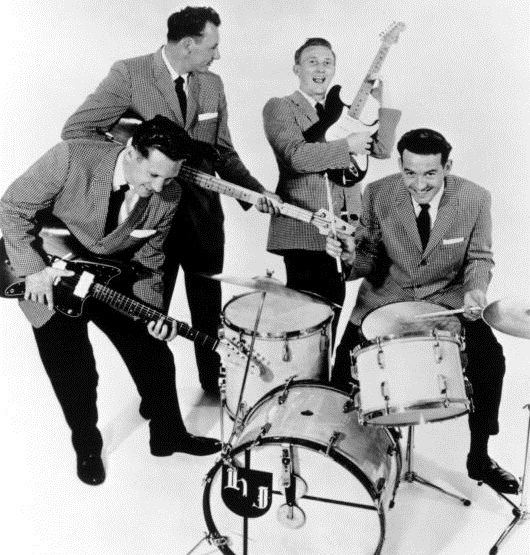 Around about the time of Holly’s death, the better known (to Australians, at least) English group called The Shadows had had to change their name from The Drifters, on receiving an injunction stating that that sobriquet had already been taken by a well established (since 1954) doo wop vocal group formed by Clyde McPhatter, one which had had a string of hits on the US mainstream and R & B charts, including, notably, There Goes My Baby in 1959. Hank B. Marvin, left, with Cliff Richard in the original English Drifters. Tony Meehan is peering out under Marvin's arm. I asked Bobby if he was aware of the English instrumentalists. “Oh, yes,” he said. “We changed our name the moment we saw them in a concert one night.” That was in St Paul, Minnesota, in 1960, during a rare early US tour by Cliff Richard, on which he and The Shadows shared the bill with Frankie Avalon, Bobby Rydell and none other than the injunction-toting Clyde McPhatter. Avalon, by the by, had taken the place of the Fargo high school band when the Winter Dance Party continued on from Moorhead in February 1959. “We knew as soon as the ‘real Shadows’ started playing and moving we weren’t in the same league as them, and felt embarrassed we’d even temporarily stolen their name,” said Bobby. “On the drive home to Fargo after the show that night, there was complete silence in the car for a long while, and then one of us said, ‘Well, what are we going to have to call ourselves then?’” They sensibly came up with The Vees. 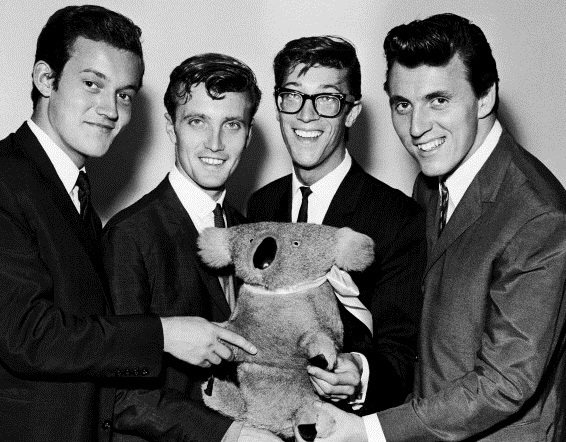 The English Shadows, with Brian Bennett, left, replacing Meehan, but still with bassist Jet Harris, second left, arrive in Australia in 1961. Lead guitarist Hank B. Marvin is second from right, beside Bruce Welch. Memo Sheldon Cooper: You may think you are the smartest man alive, but a koala is NOT a bear. That year, 1960, was momentous for the so-called “real” Shadows. They had a monster worldwide hit with Jerry Lordan’s Apache. Worldwide, that is, as in everywhere except where it really mattered - in the US. Stateside, the version of Apache which went to the top of the charts was an intriguingly intricate one played on a Gibson guitar by the Dane Jørgen Ingmann-Pedersen. On The Shadows’ version, lead guitarist Hank B. Marvin (now 30 years resident in Western Australia, where he runs the Nivram recording studio on Tiverton Street, Perth) played a Fender Stratocaster using Joe Brown’s cast-off Italian-built Binson Echorec chamber. 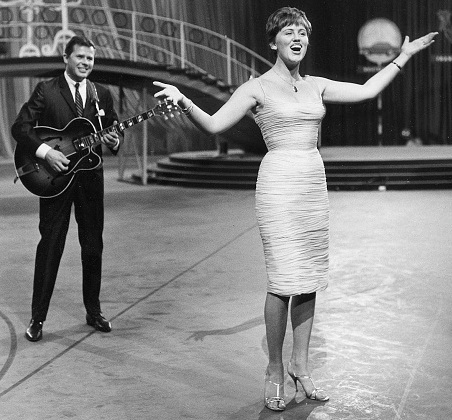 Jørgen Ingmann and his wife Grethe winning the 1963 Eurovision Song Contest with Dansevise. Back then, as the mix-up with The Drifters name indicates, news of what was happening in rock and pop on either side of the Atlantic was far from free-flowing. The Shadows’ distinctive sound came about by mistake. They wanted to emulate the sound of Ricky Nelson’s backing group, and found out James Burton used a Fender. Richard ordered the guitars by mail order catalogue, and a Stratocaster turned up. Burton used a Telecaster. Unlike Brown with his echo chamber, however, Richard and The Shadows liked the Strat sound and kept it. That simple twist of fate over Ingmann's version of Apache meant The Shadows were never able to achieve the same impact in the US as they did everywhere else in the world. Marvin influenced few American guitarists the way he did English guitar heroes, like Eric Clapton, Jeff Beck, Jimmy Page, Mark Knopfler, Pete Townshend and so many more. The original Ventures, never in the same league as The Shadows. Thus the decision of the Rock and Roll Hall of Fame foundation in February 2008 to induct The Ventures ahead of The Shadows was perhaps understandable, if no doubt galling for the legends of Shadows fans across the world, including in Australia. The foundation mentioned The Ventures’ Walk Don't Run and their cover of the Hawaii Five-O theme tune, although, of course, the version of Hawaii Five-O which everyone and their dog identifies with is the original TV series theme written and performed by Mort Stevens. Most galling of all, however, was the foundation’s claim that The Ventures provided the “defining instrumental guitar rock in the 1960s”. The Ventures simply do not stack up in this regard against The Shadows, especially the original line-up of Marvin, Bruce Welch, Jet Harris and Tony Meehan. I must disclose at this point that the soundtrack of my early adolescence was provided by The Shadows, and although my passion for their music has gradually waned over the past half century, I still regard them as, tune for tune, the greatest instrumental group ever, bar none. I know, too, I am far from alone in this opinion. Yet having said all that, I must also confess the best piece of guitar rock music I’ve ever heard is the intro to Richard’s Move It, which was played not by Marvin but by session musician Ernie Shear, using a blond Hofner with a DeArmond pick-up near the bridge and a Selmer amp. Unbeatable. Even though most of these groups were a bit before my time, I really enjoyed, and played many of Bobby Vee's, the Drifters, and the Venture's songs at home and when I was in radio. Sometimes the Shadows would be on the play list, but I do not recall hearing many of their songs. Last I knew there was still some controversy as to who can be billed as the Drifters, but that may be original members wanting to use the same name for newer reincarnations of the original Drifters.